All dogs are good dogs, Observer can confirm. 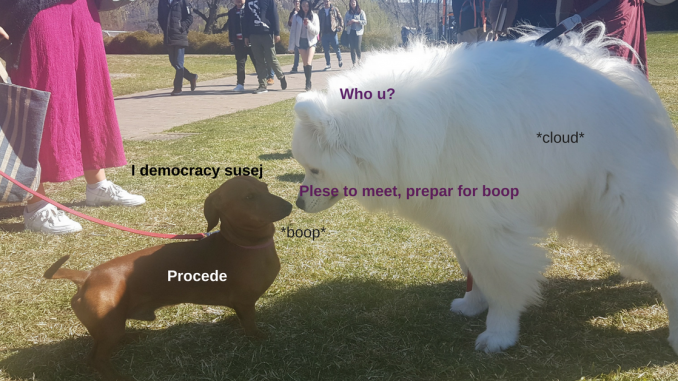 ANU students were lucky enough to have visits from a variety of extremely good dogs to help weather the trials of elections. These floofs proved useful for both recently harangued voters and endlessly ignored candidates. This is doggos of the election, explained. The job of a dog is straightforward: be the goodest boy possible (dogs of all genders are good boys). But just because this task is straightforward does not mean it is easy. Those that want to be perfect puppers must balance behaviour, cleverness, appearance, and pat-ability. 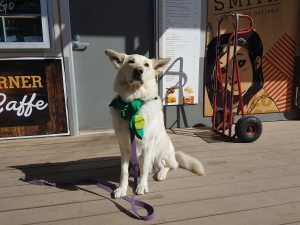 Description: Observer didn’t get to meet Barney, as he was only out and about on Monday morning – a good strategy, as this is when people need doggos the most! 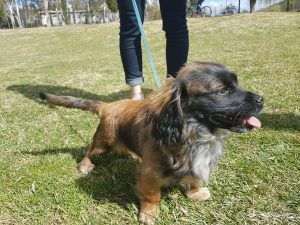 Barney is an adorable eight month old pupper who got “a little bit too excited” as a result of all of the attention he got. Perhaps he just got a little too ‘Shaken Up’. Description: Magic’s presence certainly was magical. He was a very good boy: the clever pupper was on campus almost all day on Tuesday, despite only being about a year old. His excellent and pat-able coat upheld Lift’s promise of “free hugs”. He was occasionally distracted from his duty to students by the smell of the nearby barbeque. 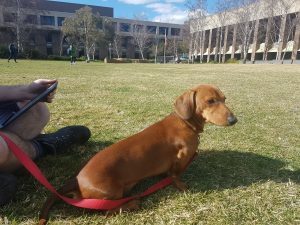 Description: Stanley is a weiner dog well versed in the world of BNOCs (big names on campus): he belongs to former Woroni Editor-in-Chief, and current Bossy Editor-in-Chief, Bronte McHenry. You may remember him from such events as Semester 1 Market Day. Stanley did not just wait for students to fawn over him – he demanded pats. He viciously attacked (read: nibbled) a Probity Officer, but was somehow still allowed to attend the ANUSA OGM. That is true power. Description: In an election that has talked a lot about gender, Luna is the only good girl we have seen (though she is still a good boy, as discussed above). This pup was not as calm as the bigger doggos brought in by other tickets, but she was by far the most pick-up-able. She also wins the prize for Softest Ears. Description: Gandalf was the only dog lucky enough to be allowed in the Pop-Up – as it is not a PARSA exclusion zone. 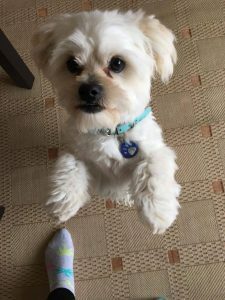 With great power comes great responsibility, and Gandalf was certainly up to it – he was a very well behaved doggo. He even sat and stayed for pictures with his human at a distance. Description: Loki is 16 months old, so he’s really still a big pupper. 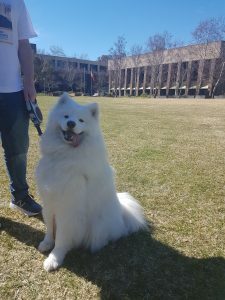 Described by many students as a “cloud on legs”, he earns the title of Floofiest Doggo of the Election. He would also frequently pose with his tongue out, as shown here. His presence was definitely helpful for Howarth, who running as an independent did not have any signage, merchandise, or flyers. 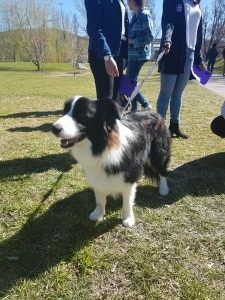 With Loki by his side, though, Howarth didn’t need to bother: students came in droves to sink their hands and faces into Loki’s super soft white fur. Voting for all positions closes at 4pm today (24 August).